Nationality: American. Born: Sidney Arnold Franklin in San Francisco, 21 March 1893; also known as Sid Franklin, S.A. Franklin, Sidney A. Franklin, Sydney A. Franklin, and Sydney Franklin. Family: Father of producer-director Sidney Franklin Jr.; brother of director Chester M. Franklin. Career: Began working in the motion pictures as an assistant cameraman, 1913; co-directed his first short films with his brother, 1914; began directing features, 1916; began work as a director at Metro-Goldwyn-Mayer, 1926; abandoned his career as director after The Good Earth , and became a producer, 1937; returned to directing with remake of The Barretts of Wimpole Street , 1957; resigned from MGM, 1958. Awards: Special Academy Award (Irving G. Thalberg Award) for "consistent high quality of production achievement," for Mrs. Miniver , 1942. Died: Of natural causes in Santa Monica, California, 18 May 1972. Franklin, Sidney, "From Play to Picture," in New York Times , 30 September 1934. "Sidney Franklin, Producer, Dies; His Mrs. Miniver Won Oscar," in New York Times , 20 May 1972. Throughout his lengthy Hollywood career, Sidney Franklin worked as a director, producer, screenwriter, assistant cameraman, and actor. He was, however, no celluloid renaissance man. He was not an artist of the cinema, in the way that a Woody Allen or an Orson Welles is considered to be. Franklin was more of an all-purpose hand, one of the scores of film pioneers who in the early years of the 20th-century entered the industry almost by accident. (While eliciting a curiosity about film in his youth, he had toiled as a stock boy, travelling salesman, and factory and oil field worker prior to becoming an assistant cameraman at age 20.) Franklin then matured and flourished, as the industry matured and flourished, becoming first a director and then a producer. In the end he was a product of the Hollywood studio system and, even more specifically, a loyal and trustworthy employee of the Metro-Goldwyn-Mayer movie factory. Franklin's films range from the child-oriented comedy shorts and features he co-directed early in his career with his brother, Chester M. Franklin, to the polished dramas and comedies he directed at MGM during the late 1920s and 1930s and the high-profile dramas he produced during the 1940s. Through the mid-1920s, he directed a wide range of product, honing his craft and becoming a technically accomplished and reliable professional. Franklin's best, most representative films are those he made at MGM, where he came to work in 1926, and he was adept at directing actresses and understanding their characters' motivations. 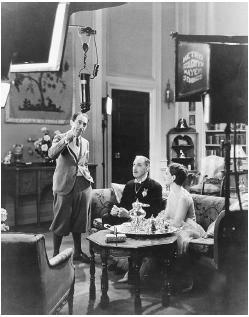 He was especially close to Irving Thalberg, the studio's "Boy Wonder" production executive, and did well guiding Mrs. Thalberg—Norma Shearer—through several films, including The Actress , Smilin' Through (which he previously had made as a silent, with Norma Talmadge), Private Lives , and The Barretts of Wimpole Street. He also directed Greta Garbo in Wild Orchids , and guided Louise Rainer to an Academy Award in The Good Earth. Franklin directed several adaptations of plays, all sophisticated comedies, including Molnar's The Guardsman (the lone starring celluloid vehicle of Broadway legends Alfred Lunt and Lynne Fontanne), Robert E. Sherwood's Reunion in Vienna , and Noel Coward's Private Lives. His concern for detail, and maintaining the essence of the original material, is reflected in an article he published in the New York Times in 1934. "Even in Hollywood the play is the thing," Franklin wrote. "We are grateful for good plays, we respect them and in translating them to the new medium we try our level best to do right by them. We realize we can get a good motion picture only by guarding with our lives the essence and structure which make the play important or significant." Then he added, "Perhaps the greatest satisfaction that can come to a director is to hear some one [sic] say of one of our efforts: 'It was as good as a play!"' In these remarks, Franklin amplifies a point that often is forgotten in a contemporary Hollywood ruled by high-concepts and special effects: without rich characterizations and a good story, you cannot have a good film. Still, the overriding fact of Franklin's career is that, while his films as director exude class, and he served his stars well, they are not reflective of any individual artistic vision. Rather, they collectively mirror his studio's patented luster. Upon completing The Good Earth in 1937—and after the premature death of Irving Thalberg—Franklin left directing; he returned only to assist King Vidor on David O. Selznick's Duel in the Sun and direct a bland remake of The Barretts of Wimpole Street in 1957. Otherwise, he went on to produce some of MGM's most prestigious pictures during the 1940s, from Waterloo Bridge, Random Harvest , and the Academy Award-winning Mrs. Miniver through The Yearling and Command Decision. With the exception of Mrs. Miniver , which benefits from the strengths of its director, William Wyler, all are products of a studio rather than an individual.